Your lawn needs water to thrive and survive. However, too little or even too much water can harm your grass. How do you find the right balance? Check out our guide for Central Indiana watering tips. Be sure to monitor the look of your lawn. Ask yourself questions about the color, the thickness, and the strength of each blade. Is the color fading? Are there patches of brown? Are the tips of the blades beginning to wilt? It’s crucial that your lawn receives 1-1.5 inches of water per week during those hot summer days. A well-watered lawn will be moist down to about six inches in the ground. Watering at night can lead to disease. It’s important to take the time to consider the best approach to mowing your grass. Efficiency should balance with your safety, as well as the health and appearance of your yard. Rule of Thumb: Mow Tall. Mow Often. Steadily maintain a proper frequency to ensure that no more than ⅓ of the total grass blade is removed at one time. Cutting more than ⅓ of the overall blade causes stress on the plant and weakens your lawn’s defenses. Before mowing, collect all debris in the yard. Sharpen your blades after 8 to 10 cuts. Mow your lawn in rows or spirals. Choose the coolest time of day to mow. Click here to learn more mowing tips. Timing is crucial when it comes to weed control. Applying herbicides too early when temperatures are not warm enough, and applying herbicides too late when temperatures are too hot, is equally a waste of time and will not effectively treat weeds. During March and April, Lawn Pride applies a pre-emergent herbicide that blankets into the soil just in time to prevent crabgrass and foxtail from germinating. To learn more about common Indiana weeds, check out the Purdue Master Gardener Guide to Common Lawn Weeds. Although Indiana weather can seem unpredictable, these weather patterns are a driving force for Indiana’s most common turf diseases. With the exception of snow mold, these lawn diseases are most prevalent in the summer, where the long, hot and humid days provide a perfect breeding ground. Thankfully, there are many things Indiana residents can do to prevent and control these diseases, such as watering, fertilizing, and treating with certain fungicides. We all love our furry friends, but there is one thing that they leave behind in our yard that we don’t love as much – urine spots. Your pet’s urine contains high amounts of nitrogen, and just like too much fertilizer, too much urine can burn your lawn and cause unwanted brown spots. Check out more tips on how to prevent and repair urine damage in your yard. Since our four-legged friends are an important part of the family, we want to make sure they remain safe and healthy, just like our lawns. Fleas, ticks, and potentially dangerous chemicals can all be hazardous to your pet if the appropriate steps are not taken. It’s important to use pet-friendly fertilizers and insecticides, to read application directions carefully, and follow the appropriate waiting period before allowing your pet to walk on your lawn. During the colder Indiana temperatures, grass blades become very brittle. Walking on your lawn during this time can crush and break these delicate blades, making it harder for your lawn to recover in the springtime. Walking on your frost or snow-covered lawn can also leave more than your footprints behind. Read more reasons on why it’s important to stay off of your yard during the winter. 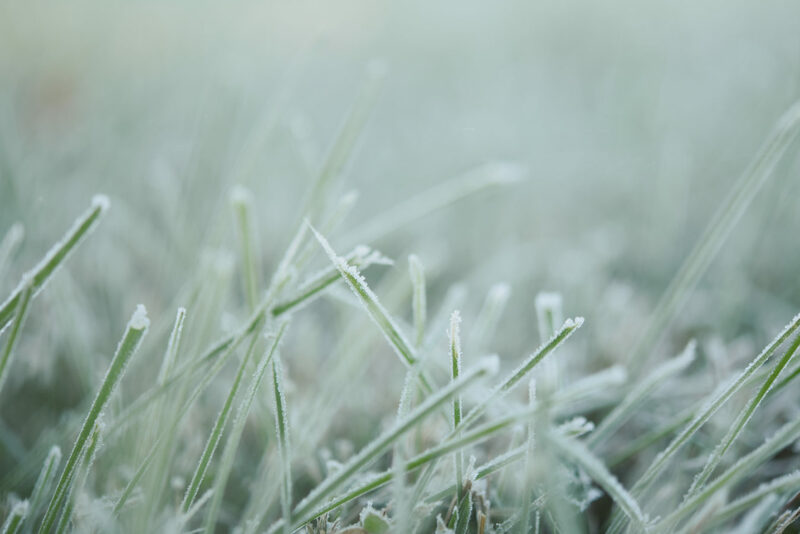 For more winter lawn care tips, read our winter lawn survival guide.